Several weavers are found on islands only, in particular the fodies in the Indian Ocean islands, 2 Ploceus weavers on Madagascar, and 3 Ploceus weavers on the Gulf of Guinea islands. 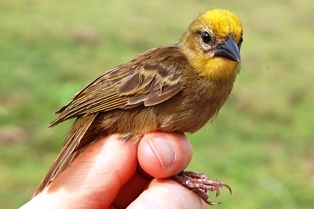 Many mainland weavers also occur on oceanic islands, either as introduced species (eg Village Weaver in Mauritius) or naturally (eg Cape weavers on Robben Island, or ). Weavers often also breed on small islands in lakes and rivers (eg Orange Weaver on the Sese Islands in Lake Victoria).